BMG. Back Issue. Winter 2009. 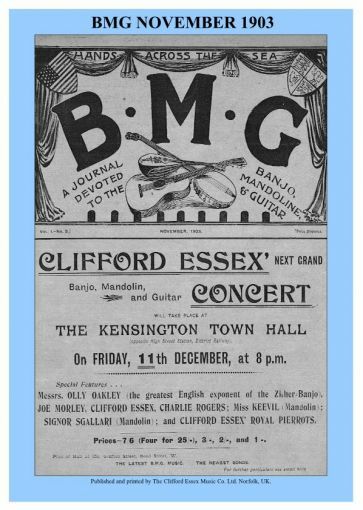 Is the oldest fretted instrument magazine in the world, founded by Clifford Essex in 1903. It concentrates mainly on acoustic fretted instruments, and contains authoritative articles of interest which will widen your knowledge and increase the pleasure gained from playing. It is published Quarterly, in March, June, September and December. It contains solos and solo arrangements of popular songs. Technical and instructive articles by the acknowledged authorities of the day are given in every issue. Questions are answered and difficulties removed. It keeps readers up-to-date with all the latest publications and inventions and informs them of forthcoming fretted instrument concerts, festivals and events. It gives access to the most prominent teachers of the instruments. It will help to increase your interest in your chosen instrument by making you better acquainted with its history and various techniques, and thus will improve your ability to play it. It reports news, opinions and suggestions impartially and closely follows the world of folk music. BMG costs £5.00 per copy, or £23.00 which includes UK postage. Outside the UK, the cost per annum is £25.00. BMG. Back Issue. Spring 2009. BMG. Back Issue. Summer 2009. BMG. Back Issue. Autumn 2009. All Four BMG Issues. 2009. BMG. Back Issue. Spring 2010. BMG. Back issue. Summer 2010. BMG. BACK ISSUE. AUTUMN 2010. BMG. BACK ISSUE. WINTER 2010.